Welcome to the Fabric Cobbler February SewAlong! I’m Roberta Burkey from Taking It Up A Notch, and I’ll be your hostess this month. I usually sew clothing for myself, my daughter, and my granddaughter with something for the boys thrown in every now and then. I recently bought a pocket organizer for the door of my sewing closet, and I like knowing where all of my sewing tools are. But it’s not close enough to my sewing machine or my ironing board to reach what I need. So I decided to make myself some pocket organizers for them. The sewing machine organizer can be adjusted in size to match your machine. It’s pictured here with my traveling machine, but I made it the width of my bigger Janome. The ironing board organizer will accommodate most standard ironing boards. 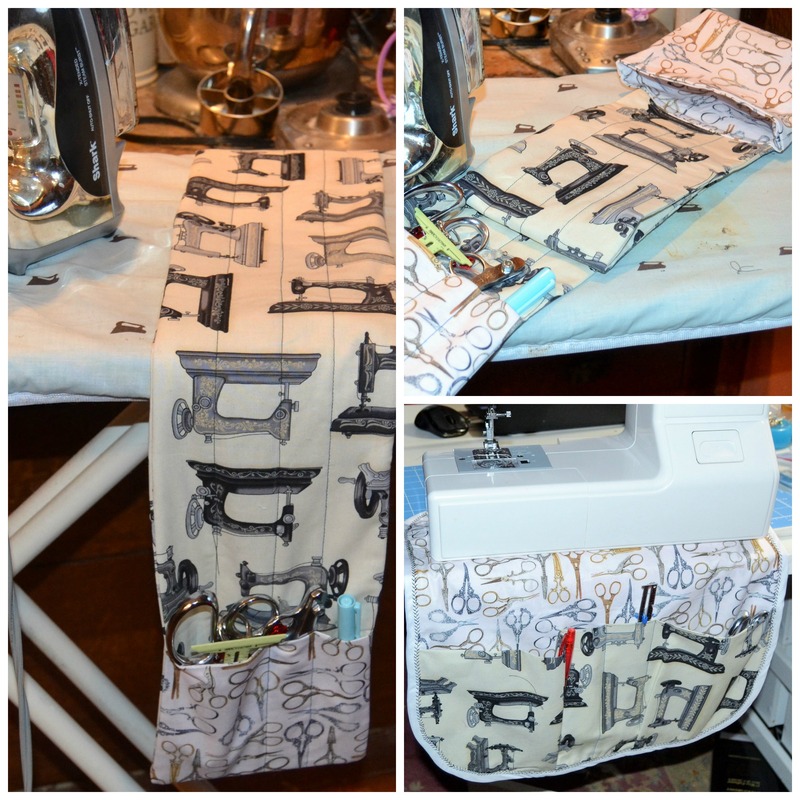 The sewing machine organizer is my own design, but the ironing board one was inspired by one designed by Moda fabrics, although I have modified it some. There are lots of ways to customize them for your needs, and I’ll include instructions for how to do that along the way. So collect up your fabric and notions and meet me back here in a few days to get started. Any coordinating fabrics will do. If you’d like to be eligible for prizes, 50% of your fabric must come from the Fabric Cobbler. This entry was posted in Crafts, Uncategorized and tagged fabric cobbler, materials list, sewalong, sewing machine caddy. Bookmark the permalink.